To become enmeshed in a war of incalculable variables; to be at bloody bruised loggerheads – this is the Syrian nightmare, where there are more punters than odds. 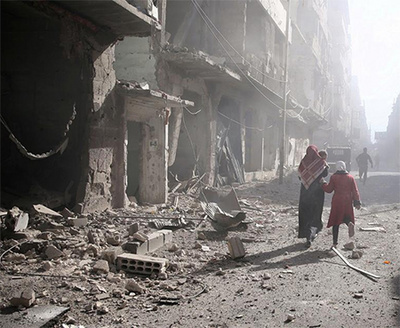 Savagely, Syria as a state is being ravaged and mauled to the point of non-recognition. It is now a mere terrain for heavily armed bullies, a smoky crusted ruin of dust and cosmic ruin, its populace fleeing when it can, shielding itself when it must, and hoping for the best. The great power play never assumes that small states matter. They supply the necessary show for the big game, the theatre set for the show down in which the small scatter whilst the big boys level the punches. In history, the bully is insentient, and normally stumbles into mistake and catastrophe. One coalition had slighted another, though it was hardly the first time. Last September, 62 Syrian government troops were killed in a US strike. The reaction these latest engagements was theatrical, with Moscow being furiously remonstrative. An important ally needed shouldering; promises and reassurances needed to be made. To that end, the use of the US-Russian hotline used to avoid collisions in Syrian airspace was suspended. A promise more with bark than bite also suggested that aircraft flown by the coalition west of the Euphrates would be targeted. None of this suggests a remarkable shift: the danger in such a conflict remain the cooks pondering a spoiling broth. De-confliction has become the mangled word of Pentagon speak since a zone of sorts was agreed to between Washington and Moscow. This designation, designed to avoid conflict, has simply refined it. This has led to sharp military encounters, with US-led coalition aircraft striking pro-Assad forces in an effort to prevent an advance from the Al-Tanf garrison in south-eastern Syria. By all means do well against Islamic State forces, but do in moderation. Such attacks have naturally been given the justifying coating of self-defence, because it seems that no force in Syria is ever provocative or aggressive. More of these incidents are bound to take place in the wake of ISIL retreats in its efforts to focus on defending Deir Az Zor and Raqqa. Vacuums left are rapidly filled. Syrian government gains have been looked at with some worry by US-allied forces who see the removal of Assad as key. As a statement from the Syrian news agency SANA claimed earlier this month, “army units in cooperation with allies managed to arrive at the border… with Iraq” for the first time since 2015. As if this wasn’t enough, US and Russian military authorities have been bandying about accounts of an encounter between an American RC-135 reconnaissance plane and a Sukhoi Su-27 that took place 25 miles north-west of Kaliningrad. The Russian version saw the reconnaissance plane moving dangerously in the direction of the Russian jet. The US account was predictably different: the Russian aircraft had flown “erratically” in its approach, coming within mere feet of the RC-135. For those with anxious historical minds, the sense of a global conflict stemming from the small is clear. In 1914, it was a political assassination pinned on Serbia, the noted scapegoat in a European lust for self-destruction. In the Syrian scenario, the lust is less pronounced but present. None of the powers genuinely wants to shed the blood of the other, but the necessity for doing so, through pretext, through design, and, finally, through incompetence, is there. But true to form, the stance on suspension was revised in an announcement made two days later. Australian officials had evidently understood the Russian warnings to be manageable. The military show, in other words, must go on.